For travelers planning for safaris in Rwanda should catch fancy with the interesting loviest flora and fauna available at Nyungwe. As Rwanda’s famous rain forest region and the only forest in Africa left with rainforest vegetation, the popular Nyungwe National Park is proud of beautiful biodiversity which is eye catching to the travelers on their wild life safaris in Rwanda. The park is palace to 13 different primate species and among these includes the interesting chimpanzees. 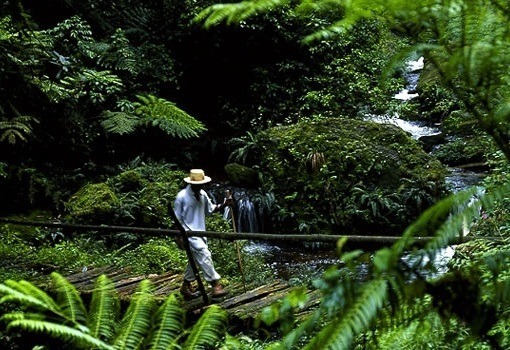 There are 13 different hiking trails that are developed to help travelers on their Rwanda safari destination of Nyungwe national park to walk and hike through the interesting green rainforest vegetation in Nyungwe Park. The trails are bit challenging but so much rewarding to travelers who explores the park through these trails. There are two centers where trail heads start which can be used by travelers to explore the wonderful Nyungwe national park. The famous Uwinka Reception Center is located in the heart of Nyungwe Park and its where the majority of the trails activities in the park start from. The most rewarding being the well-known Canopy Walk. Tourist on their Rwanda safaris should know that only cash money is accepted at Uwinka, and the recommended currencies include Rwandan Francs, American dollars or Euro currencies.